This is the fifth in a six-part Toolshed series that uses FanGraphs' Steamer600 projections to look at how prospects would fare over a full Major League season in 2019. The system bases its forecast on 600 plate appearances for position players, 450 plate appearances for catchers, 200 innings for starting pitchers and 65 innings for relievers -- taking into account age, past performance and previous Minor League levels, among other factors. The Astros have a Top-100 prospect who has a plus-plus fastball capable of touching triple digits and could be the Major Leagues' best rookie pitcher in the 2019 season. It's not hyperbole. It's also not Forrest Whitley. While the prospect world gets hyped up about the potential ascension of Whitley (MLB.com's No. 7 overall prospect), Josh James, who checks in at No. 62, is in line to be the most valuable rookie hurler in the American League, according to Steamer600 projections. He looks set to take a prominent role in the Houston rotation. Before getting into that, let's address the past statistical performances that informed the projections -- and the backstories behind those as well. James was a 34th-round pick out of an Oklahoma junior college in 2014 and turned pro for just a $15,000 signing bonus. He showed some promising results in the early years, but got shellacked en route to a 4.81 ERA over 110 1/3 innings with Class A Advanced Lancaster in 2016. Without stellar stuff to lean on, he didn't have much of a prospect profile, especially in an Astros system typically loaded over the past half decade. But James was diagnosed with sleep apnea after the 2016 season and began to address it through a CPAP machine. His 2017 season was a slight improvement, but Houston really noticed a difference heading into the 2018 campaign, especially when it came to James' conditioning. With his improved energy levels, the right-hander's velocity took off, going from low-90s earlier in his career to averaging 97.1 mph when he made the Majors in September 2018. It's even hit triple digits when he's needed extra gas. His changeup is also a plus pitch and his slider can be above-average, though inconsistent. That jump in stuff is a big reason why James didn't enter the 2018 season as a ranked Astros prospect and finished it not only as a Major Leaguer, but No. 95 overall. He jumped up 33 spots when MLB.com updated its ranking list for the 2019 campaign over the weekend. But it's not just in terms of stuff that makes the 25-year-old right-hander stand out. His numbers in 2018 were pretty amazing. James tied for fourth among all Minor Leaguers in 2018 with 171 strikeouts over 114 1/3 innings between Double-A Corpus Christi and Triple-A Fresno. His 36.3 percent strikeout rate was the lowest among the 782 Minor League pitchers with at least 75 innings. He rounded out the MiLB portion of the resume with a 3.23 ERA, a 1.12 WHIP and a .189 average-against, proving nearly untouchable in many aspects. The only slightly dark mark was his 10.3 percent walk rate, but that didn't prevent the Astros from summoning James to the Majors when rosters expanded in September. He split time between starting and relieving roles with the big club and managed to hold his own despite the constant change, finishing with a 2.35 ERA, a 0.96 WHIP, 29 strikeouts and seven walks in 23 innings. He also made a pair of relief appearances in the ALCS against the Red Sox. Included there are three other Top-100 prospects and James' teammate Valdez. It's an impressive list. Not only does that put James in good rookie company, it also makes him a strong contender to open 2019 in the Astros rotation. Only Justin Verlander (4.7) and Gerrit Cole (4.6) have higher WAR projections than James does, and even if Collin McHugh technically slides ahead of him for the No. 3 spot in the rotation, James faces little competition to snag one of the two remaining openings -- one of which was left by the potential free-agency departure of Dallas Keuchel and the other by Lance McCullers Jr.'s Tommy John surgery. That brings us to Whitley. MLB.com's top overall pitching prospect has set himself up to be a juggernaut when he arrives in the Majors, even after losing much of 2018 due to a 50-game suspension for a drug violation and lat and oblique injuries. When healthy and on the mound -- as he was in the Arizona Fall League last autumn -- the 21-year-old right-hander has four plus to plus-plus pitches that continually have sent even the best prospects in the game back to the dugout shaking their heads. His 36 strikeouts led the AFL and came in only 26 frames; he walked only seven in that span. Because of that combo of stuff and last looks, Whitley will be on the tips of many fans' tongues this spring. But Steamer doesn't take into account scouting reports and non-regular-season numbers, so in this area, Whitley does trail James on the above table. Following a potential return to Double-A Corpus Christi or even a jump to Triple-A Round Rock, the hope is Whitley joins up with his fellow right-hander in the Major League rotation quickly in the summer, giving Houston a formidable first four in the rotation in its quest to return to the glory of the 2017 World Series run. Most ready: James. Also a quick word on Kyle Tucker: The No. 8 overall prospect would be penciled into the Major League Opening Day outfield for most other organizations after he tore up Triple-A with a .332/.400/.590 line, 24 homers and 20 stolen bases in 2018. But he struggled in the Majors, going 9-for-64 (.141) during his 28 games with Houston, and the Astros signed Michael Brantley this offseason to take over duties in left field right away. So it's likely Tucker will open 2019 back in the Pacific Coast League. However -- Major League issues aside -- Steamer still thinks he'd be an above-average hitter, and his 1.9 WAR projection is equal to that of starting right fielder Josh Reddick. Houston shouldn't be afraid of giving Tucker another shot at either corner, given his ceiling of being a plus overall and power hitter. Give it time: Yordan Alvarez should be in consideration for a Major League spot at some point on the strength of his bat, which Steamer believes would be average right now. But first, the Astros have to figure out his official position with left field and first base both still on the table. The offensive hurdles at both spots will be high, so the No. 44 overall prospect will have to show he can be better than average offensively before Houston calls him to The Show. 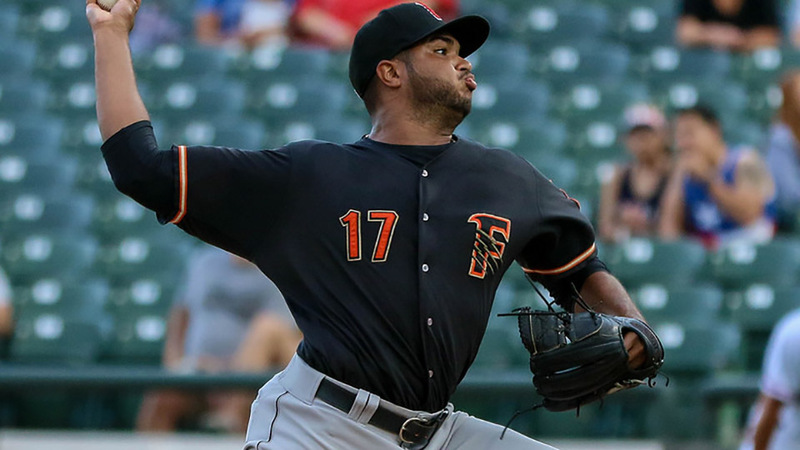 Wild cards: Framber Valdez made a solid impression by posting a 2.19 ERA and striking out 34 in 37 innings with the big club last season, but 24 walks and a 4.65 FIP in that same span speak to some luck being involved there. With Valdez's profile containing just two plus pitches, it's a question of whether his future lies in the bullpen or in the rotation. Whitley's ascension someday might push Valdez into a relief role. But for now, Steamer believes in the 25-year-old left-hander's starting potential, making him one of four Astros starters to receive a WAR projection above 2.0. By midseason, Houston might be singing a different song, but right now, Valdez is best suited to start so the Astros can see how deep he gets through games. Top-100 talent: J.B. Bukauskas (No. 97) missed two months due to a back injury suffered in a car accident, but he showed Steamer enough to rank seventh among Astros starters in WAR projection. He should be ready to take off at Double-A Corpus Christi much like he did in the Arizona Fall League, where he showed a plus fastball and plus slider. Corbin Martin (No. 81) jumped into the Top 100 for the first time for his plus fastball and above-average curve and slider, but unfortunately received a reliever projection. The Astros have every intention of making the 2017 second-rounder into a Major League starter, and that could happen in 2019 after he threw 103 innings at Double-A last season. Most ready: The Halos were aggressive with their most talented Minor Leaguers, and that organizational strategy has Jose Suarez knocking on the door to Anaheim. The 21-year-old left-hander started the season with Class A Advanced Inland Empire but spent most of it with Triple-A Salt Lake, where he had a 4.48 ERA with 73 strikeouts in 78 1/3 innings. (The former number is inflated some by the Pacific Coast League.) His 1.9 WAR stands fifth-best among Steamer projections for potential Angels starters, but it's likely that offseason signing Matt Harvey (1.2) will jump over Suarez in the rotation race this spring. The Venezuela native's off-speed pitches are advanced enough that he should get a Major League look early, and the Angels shouldn't be afraid to continue their aggressive path with him if they hope to compete for a playoff spot in 2019. Give it time: Griffin Canning feels like he should be right there with Suarez in terms of competing for a Major League spot this spring, especially since he comes in at No. 63 on the Top 100. However, Steamer thinks the 22-year-old right-hander should be just behind Suarez on the depth chart, and that maybe shouldn't be a surprise given Canning threw fewer innings at Triple-A (59) and had less success in that time (5.49 ERA). The 2017 second-rounder still has the higher ceiling of the pair with all four of his pitches receiving above-average to plus grades from MLB.com this offseason, but he'll need to show that arsenal off a little longer at Salt Lake and get some better results to strengthen his case. Wild cards: Ty Buttrey ended up saving four games for the Angels following his July 31 trade and Aug. 16 callup, and according to Steamer, he'll be of some use out of the Major League bullpen with his 3.71 ERA, 3.95 FIP, 9.4 K/9 and 0.3 WAR projections over 65 innings. The only Angels reliever to receive a higher WAR projection is free-agent signing Cody Allen (0.4), who should assume closing duties upon his arrival in Orange County. But Steamer still projects Buttrey to have a lower ERA and FIP than Allen's 3.82 and 3.96, so it's possible this could be more of a competition than the eye test would suggest. Top-100 talent: Jo Adell (No. 14) must feel like The Second Coming of Trout for some Angels fans. Indeed, the 19-year-old outfielder was mighty exciting in 2018, hitting .290/.355/.543 with 20 homers and 15 steals across three levels. He'll be 20 for all but one week of the 2019 season and will likely open up back at Double-A, two levels removed from the Majors. Steamer isn't high on him making an immediate rush to the Majors, but it's a possibilty that the 2017 10th overall pick could climb to The Show, carrying with him four plus tools and an above-average hit tool. Most ready: A's general manager David Forst is going to have keep answering questions about Jesus Luzardo's potential spot in the rotation until his club's top prospect is pitching on a Major League mound, and Steamer justifies those queries quite clearly here. Luzardo's 2.1 WAR projection is the highest for any potential A's starter, well ahead of Mike Fiers (1.3) and Marco Estrada (0.3) -- the expected top two. Yes, Oakland can point to Luzardo's 7.31 ERA over four Triple-A starts at the end of 2018 as a reason he'll need to open up with Las Vegas, but Steamer is more informed by the whole picture, namely his 2.88 ERA, 1.09 WHIP, 129 strikeouts and 109 1/3 innings across three levels at age 20. With two plus pitches in his fastball and changeup and another above-average offering in his curve, Luzardo has no trouble getting Minor League hitters to swing and miss, and his impressive control only makes that package play up. The game's top left-handed pitching prospect should get a long look as a non-roster invitee this spring and should be Oakland's first callup when rotation help is needed shortly after the season starts. Give it time: A.J. Puk is right there with Luzardo in terms of projections. Unfortunately, that's all based on his 2017 season. The 23-year-old southpaw missed all of 2018 after undergoing Tommy John surgery last April. When he last pitched, he ranked third in all of the Minors with 184 strikeouts in 125 innings and was best among top prospects in FIP. Even after the missed time, Steamer still expects him to strike out about a Major League batter per inning. It'll still be a bit before that is put to the test. Puk has begun his throwing program this offseason but will likely be brought along slowly as part of the rehab process. Oakland would love to see him in the Majors at some point in 2019; it just won't be until the second half in all likelihood. Wild cards: Jorge Mateo was once a Top-100 prospect and also a cause for some excitement when he moved from the Yankees to the A's for Sonny Gray at the 2017 deadline. He still might be one of the fastest athletes in all of affiliated baseball, Majors or Minors. Now after his first full season in the Oakland pipeline, however, he's even more of an enigma than he was during his early days in pinstripes. The 23-year-old shortstop hit just .230/.280/.353 and struck out 139 times in 131 games with Nashville last season. His 62 wRC+ was second-lowest among qualified Pacific Coast League hitters. That's not going to help matters when it comes to Steamer, and the projections believe Mateo would only be a replacement-level Major Leaguer. The good news is that Mateo's 26 stolen bases would be tops of any Oakland speedster. As a member of the 40-man roster, Mateo could jump to the A's as a set of wheels off the bench. But it's going to take a big turnaround with the bat to make that even a possibility, and Marcus Semien, Franklin Barreto and Jurickson Profar ahead of him on the middle-infield depth chart. Top-100 talent: Sean Murphy (No. 45) would be a fun battery pairing with Luzardo and Puk, considering his best tools are behind the plate instead of at it. Expected to open in the PCL, the 24-year-old should be ready by midseason while Josh Phegley and Chris Herrmann keep the seat warm. Carrying his .288/.358/.498 line from Double-A Midland to Triple-A (where he played three games) would go a long way toward pushing up that timeline. A rough run in the Dominican Winter League, where Murphy is making up for at-bats lost to a broken hamate bone last summer, might temper some optimism in that department. Most ready: The Mariners are entering an obvious rebuilding phase, and it could be Justus Sheffield that benefits quickest and most directly. Seattle acquired the No. 43 overall prospect from the Yankees in this offseason's deal for James Paxton, and he'll head to Arizona with at least a chance to crack Seattle's rotation after making his Major League debut late last season. Service time might dictate he'll open up at Triple-A Tacoma, but that spring camp competition could be fairly close. Steamer has Sheffield tied for the fifth-best WAR projection among potential Seattle starters, right next to Felix Hernandez (1.1) and ahead of Wade LeBlanc (0.8). That doesn't include offseason addition Yusei Kikuchi, however, and his arrival from Japan likely will take away a potential spot from Sheffield. The 22-year-old southpaw doesn't have much left to prove at Triple-A after putting up a 2.56 ERA and a 1.16 WHIP with 84 strikeouts in 88 innings with Scranton/Wilkes-Barre last season, and if he can pick up right where he left off, then he'll head to Emerald City within weeks, if he doesn't make the club out of spring. Give it time: Shed Long's move from the Reds to the Mariners came as a small surprise, given that everyone believed the 23-year-old second baseman was going to the Bronx for Sonny Gray. Instead, the Yankees decided they wanted to keep a 40-man roster space open and moved Long to Seattle for 2018 second-rounder Josh Stowers. Now Long has moved atop the prospect table for rookie projections on the strength of his above-average bat and the positional adjustment that comes with his spot at second base. That said, Long, who first worked as a catcher in the Minors, still has room to grow defensively, and it's possible his defensive issues -- which Steamer doesn't take into account -- could erase a good portion of the value brought by his bat. Long still hasn't seen Triple-A ball, so he'll head to Tacoma first, and it'll be on him to prove both his bat and glove are ready to potentially replace Cano in the Mariners' attempted rebuild. Wild cards: It shouldn't be breaking news to anyone in Seattle that Lewis is here. The Mariners took the Mercer star with the 11th overall pick in the 2016 Draft because of his five-tool potential, only to see him battle multiple knee injuries in the near three years since. Lewis' 86 games played in 2018 were a career high, albeit a low one, and his .244/.306/.405 line with nine homers across two levels didn't jump off the page. That leads to a replacement-level projection. But Lewis did end 2018 with Double-A Arkansas (where he had an 87 wRC+), so technically a 2019 debut should be in reach. That'll especially be the case if the knee woes are behind him. Lewis might lose some speed, but there's still the potential for his bat to force his way to Seattle. M's fans and brass will be watching closely regardless. Top-100 talent: Acquired in the Robinson Cano/Edwin Diaz deal, Justin Dunn (No. 91) had a nice bounceback campaign in 2018 with a 3.59 ERA and 156 strikeouts in 135 1/3 innings between Class A Advanced St. Lucie and Double-A Binghamton after he struggled in his first full season in the Mets system a year earlier. Those 2017 issues still might be dragging down his Steamer projection, but the good news is he was likely to open at Tacoma anyway. He'll still have to prove his latest improvements are enough to keep him in a starting role in the long term. Most ready: It's not exactly an exciting group here, at least in terms of Major League readiness. The Rangers' top four prospects have yet to play above Class A Advanced, and three of the four are 20 or younger (Julio Pablo Martinez being the exception at 22). So instead of someone flashy here, the most obvious pick for Major League-ready ranked prospect is No. 29 Jeffrey Springs. The 26-year-old southpaw popped into the rankings by fanning 98 batters and walking only 19 over 56 2/3 innings as a reliever at Double-A Frisco and Triple-A Round Rock in 2018. That led to a Major League callup on July 31 and he never looked back, posting a 3.38 ERA and a 1.14 WHIP over 18 appearances. With 32 innings under his belt, Springs needs only 18 more to graduate from prospect status, and he should get those in due time as the primary lefty out of the Texas bullpen. With a plus changeup and some deception in his delivery, Springs shouldn't have much of a problem racking up the K's, and Steamer backs that up with a 9.6 K/9 projection. Give it time: Taylor Hearn has an interesting profile with a mid- to high-90s fastball, a good changeup and an improving slider -- all coming from the left side of a 6-foot-5 frame. The fact that he leads the WAR projection for Rangers rookies only adds to the intrigue. As always, context is key, and a 1.1 WAR projection does not a Major League-ready pitcher make. Hearn still has some control concerns, even if he's made strides in that department, and Major League bats wouldn't have much difficulty exploiting those. Also, even though he's averaged 10.4 K/9 during his four years in the Minors, the 24-year-old left-hander wouldn't come quite as close to standing out in that department in The Show, Steamer believes. After spending all of 2018 at Double-A in the Pirates and Rangers systems, Hearn will open 2019 at Triple-A for the first time, and if he can show continued improvement with the breaking ball and with his control, then he'll get a chance to crack the Major League rotation at some point. It just won't be as early as this chart alone perhaps would have you believe. Wild cards: Joe Palumbo might be the biggest wild card of any Rangers prospect, regardless of potential Major League readiness. The 24-year-old left-hander missed much of the 2017 and 2018 seasons due to Tommy John surgery. After returning late last June, Palumbo was back to throwing in the mid-90s by the end of the season and finished with a 2.78 ERA, a 0.99 WHIP, 59 strikeouts and 10 walks in 45 1/3 innings. If he can carry that mix of stuff (including a plus curveball) and results over a longer period starting at Double-A Frisco, he could be a Top-100 prospect by the time lists are updated in the middle of the season. Then again if all that happens, it might not matter, considering he's already on the 40-man roster and would be an easy callup. Steamer gives him an unfortunate reliever projection here, but Texas believes, health willing, he'll be a starter, perhaps even a Major League one by the end of 2019. Top-100 talent: The 2019 season will be an important for Julio Pablo Martinez (No. 88), who did not play for a full-season team in 2018 but finished the year in the Arizona Fall League. The 22-year-old outfielder could be an above-average hitter with plus speed, and the Rangers would love to see him take off like he did in the AFL, where he hit .327/.397/.519 in 13 games. Hans Crouse (No. 85) is also on the slow track after being taken in the second round of the 2017 Draft, but his plus-plus fastball and plus slider could get him on a fast track before long. Leody Taveras finished 2018 as Texas' top prospect but dropped out of the Top 100 altogether because of offensive inconsistency as a 19-year-old in the Carolina League.